It is time for another Adirondack Lifestyle public service announcement. Number 1: Please do not feed the wild animals. It is ok to feed the animals who are training here, but not the wild ones. As we've seen with black bears, when people feed wild animals they become habituated to human contact. Yes, I realize it might seem neat to get close to cool looking animals like moose, but they are extremely dangerous. Adirondack Moose are not Bullwinkle. They tend to stomp and kick other creatures to death when they feel threatened. 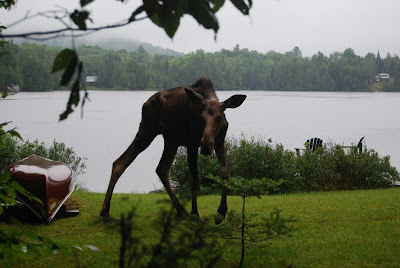 I realize the stay-away-from-wild animals topic has been discussed on this blog before, but the resident biologist is currently working with today's featured blog star, a yearling female moose who is not very afraid of people. Ed is working to educate the public not to feed wild animals. I assumed we all learned this in grade school, but he advises this is not the case. He reminds us that getting too close to wildlife is dangerous for you and for the animal. If the moose eventually kills someone then the moose will most likely be euthanized. I don't think it is fair to kill the animal who is only doing what she is programmed to do, but that is how these things come down. "Watch moose from a safe and respectful distance. Moose are bigger and faster than any person and give little warning before attacking a perceived threat. Cows are extremely protective of their calves. Bulls in the rut are unpredictable. No one should ever approach these animals no matter how tolerant they appear. Moose are unafraid, not friendly. A moose that decides someone has crossed into their "personal space" will knock down the offender and kick and stomp until the threat stops moving." I guess it bears repeating.....duh.